← Does Refactoring turn unit test of TDD to integration tests? The bad news is that TDD still lies outside my normal toolbox. The good news is that I can pinpoint a specific area where I need training in order to learn TDD properly. This blog post is the story about my revelation. I hope that you can gather some ideas for your own progress, implied that you’re no TDD master, too. Given several input lists of commits, now used as queues, and one result list that is initially empty, repeat the following step until no more commits are pending in any input queue: Compare the head commits of all input queues by their commit date and remove the oldest one, adding it to the result list. 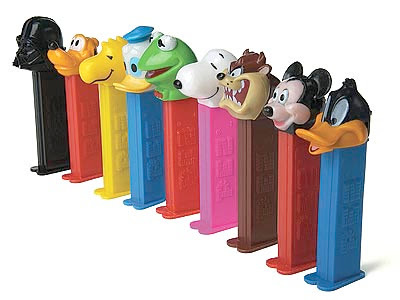 I nick-named this approach the “PEZ algorithm” because each commit list acts like the old PEZ candy dispensers of my childhood, always giving out the topmost sherbet shred when asked for. The first test only prepares the classes’ interface, naming the methods and trying to establish a fluent coding style. Now we are talking! If you give the CombineCommits class two branches with intertwined commit dates, the result will be a chronologically ordered collection. The only problem with this test? It needed the complete 100 lines of algorithm code to be green again. There it is: the “one-two-everything”-trap. The first two tests are merely finger exercises that don’t assert very much. Usually the third test is the last one to be written for a long time, because it requires a lot of work on the production side of code. After this test, the implementation is mostly completed, with 130 lines of production code and a line coverage of nearly 98%. There wasn’t much guidance from the tests, it was more of a “holding back until a test allows for the whole thing to be written”. Emotionally, the tests only hindered me from jotting down the algorithm I already envisioned and when I finally got permission to “show off”, I dived into the production code and only returned when the whole thing was finished. A lot of ego filled in the lines, but I didn’t realize it right away. This test didn’t improve the line coverage and was green right from the start, because the implementation already acted as required. There was no guidance in this test, only assurance. And that was my session: The four unit tests cover the anticipated algorithm completely, but didn’t provide any guidance that I could grasp. I was very disappointed, because the “one-two-everything”-trap is a well-known anti-pattern for my TDD experiences and I still fell right into it. The first test starts as no big surprise, it only sets “the mood”. Notice how we decided to keep the CommitCombiner class simple and plain in its interface as long as the tests don’t get cumbersome. The second test asserts only one thing more than the initial test: If the combiner is given empty commit queues (“branches”) instead of none like in the first test, it still returns an empty result collection (the commit “trail”). With this test, there was the first meaningful appearance of production code. We kept it very simple and trusted our future tests to guide the way to a more complex version. Notice how this requires the production code to come up with the notion of comparable commit dates that needs to be ordered. We haven’t even introduced a second branch into the scenario yet but are already asserting that the topmost mission critical functionality works: commit ordering. Now we need to advance to another requirement: The ability to combine branches. But whatever we develop in the future, it can never break the most important aspect of our implementation. You might say that we knew about this behaviour of the production code before, when we added the test named “branchWithCommitResultsInEqualTrail”, but it really is the assurance that things don’t change just because the amount of branches changes. Note that the only thing that’s different is the order in which the branches are given to the CommitCombiner. With this simple test, there needs to be some important improvements in the production code. Try it for yourself to see the effect! If you compare this “full” test case to the third test case in my first approach, you’ll see that it lacks all the mingled complexity of the first try. The test can be clear and concise in its scenario because it can rely on the assurances of the previous tests. The third test in the first approach couldn’t rely on any meaningful single-faceted “support” test. That’s the main difference! This is my error in the first approach: Trying to cramp more than one new facet in the next test, even putting all required facets in there at once. No wonder that the production code needed “everything” when the test requires it. No wonder there’s no guidance from the tests when I wanted to reach all my goals at once. Decomposing the problem at hand into independent “features” or facets is the most essential step to learn in order to advance from Test First to Test Driven Development. Finding a suitable “dramatic composition” for the tests is another important ability, but it can only be applied after the decomposition is done. The final and complete second implementation, guided to by the tests, is merely six lines of active code with some boiler-plate! Well, what did I expect? TDD doesn’t lead to particularly elegant solutions, it leads to the simplest thing that could possibly work and assures you that it will work in the realm of your specification. There’s no place for the programmer’s ego between these lines and that’s a good thing. Thank you for reading until here! I’ve learnt an important lesson that day (thank you, Jens!). And being able to pinpoint the main hindrance on my way to fully embracing TDD enabled me to further improve my skills even on my own. It felt like opening an ever-closed door for the first time. I hope you’ve extracted some insights from this write-up, too. Feel free to share them! Doch der Post gibt mir jetzt doch einmal Anlass, das Ganze etwas genauer zu hinterfragen, wenn selbst du deine Probleme mit TDD hast. Vorweg sei gesagt, dass die einzige Berührung die ich bisher mit Unit Tests hatte damals in deiner Vorlesung an der DHBW war, sprich mit TFD oder TDD hatte ich auch seit dem nichts mehr zu tun, frage mich aber immer wieder, ob es nicht doch der richtige Weg ist. Jedoch kommen dann gleich wieder Zweifel auf, die mir sagen, dass ich selbst mit TDD nie eine Garantie dafür bekomme, dass mein Programm zuverlässig das tut, was es tuen soll. Wie geht man beispielsweise mit Situationen um, wo es (unendlich) viele variationen der Eingangsdaten gibt, die immer mal wieder zu Sonderfällen führen, die man so vorher sich nie hätte ausdenken können. Ich muss dazu sagen, dass es bei dem Beispiel natürlich schon eine allgemeine Form von Eingangsdaten gibt (es handelt sich vereinfacht gesagt um zweidimensionale geometrische Objekte), jedoch führen natürlich einzelne Ausprägungen sowie die Lage in der Ebene und verschiedene Kombinationen zu dieser Vielzahl an Möglichkeiten. Wie gesagt, ich habe noch keine wirkliche Erfahrung mit TDD, wodurch es natürlich sein kann, dass es für solche Situation doch eine Lösung gibt, wie man das Ganze mit TDD absichern könnte. Oder wäre hier die Divise einfach das Grundlegende mit TDD zu entwickeln und im Nachhinein mit sovielen Testdaten bzw. Simluationen wie möglich zu arbeiten, wie es ja bei der “normalen” Entwicklung dann auch der Fall wäre? thank you for your comment. I’ll answer in english to give others the chance to chime in. I hope it’s no surprise that I’m still learning to apply TDD in my day-to-day work. I thought to make this very clear in my lectures: I’m (still) the wrong guy to teach TDD. I might even be the wrong one to learn TDD. That doesn’t mean I’m unfamiliar with the mechanics of TF or even unskilled in applying TF. For me, these (TF vs. TDD) are two different approaches, even if they seem to be very similar at first. The blog post you answered to should point out some of the differences. To your question about how to apply TDD when facing a potentially infinite number of variations: The first step is to try to categorize your input data. If you can’t find categories (like “intersecting rectangles” or “adjacent circles”), you’ll have a hard time to specify your code behaviour. The (unit) tests of your code ideally represent this specification. If you can’t specify it beforehands, TDD and even TF isn’t for you and/or this use case, but you can still use some kind of “immediately after”-testing. Don’t despair if TDD seems frightenly hard to grasp – it looks that way for many of us, me included. Start with the simple cases where you know beforehands what should happen and try to develop them in TDD style. Then continue with whatever development process suits you. No need to tortue yourself with a process that doesn’t “click”. And please remember: TDD isn’t the only way to go. It’s the existence of (good) tests that matter most. TDD is just a way to gain profit from a habit that might easily be mistaken for a chore (writing tests). If you don’t gain profit – invest in something else. In summary: Your suggestion at the end sounds very reasonable. Try it!